Designing the Perfect Reading Nook for Winter Weather | Salt Dough Ornaments with a Twist! From snow and ice to freezing rain and cold temperatures, there’s a lot to explore about weather in winter. The winter season provides wonderful opportunities for fun and engaging science experiments in the classroom. Here are three of our top picks for winter-themed science experiments for kids! How do you make fake snow? Well, if you only need enough to do snow science experiments with kids, it’s actually pretty simple. Check out the video and instructions below for information on how to make DIY Fake Snow in your classroom. Squirt half a can of shaving cream (about 3 cups) into a large mixing bowl. Please note that the experiment will not work with shaving gel. Pour an entire box of baking soda onto the cream and mix thoroughly. The mixture will become a snowy texture that is easily moldable and cold to the touch. How does a polar bear stay warm in the cold? Polar bears have thick layers of blubber (or fat) covered in fur to help protect them from the cold. The blubber helps insulate their body temperature—much like when we wear a thick sweater under a coat to help us stay warm. If you’re looking for fun winter science activities to do with your students or want to provide them with a hands-on opportunity to learn how blubber works, check out our Polar Bear Science Experiment! Visit the activity page for helpful tips and full instructions. How do ice crystals form? 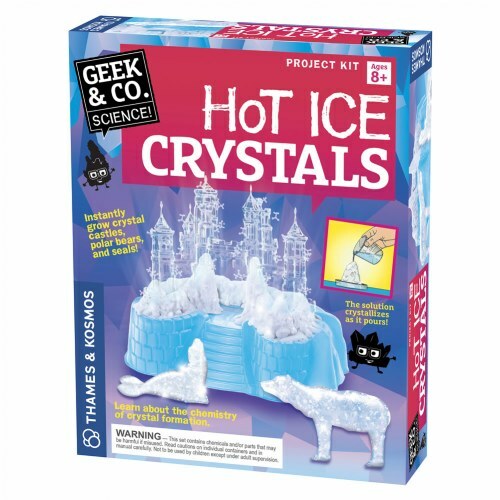 The Geek & Co. Science Hot Ice Crystals help children learn about chemical reactions and crystal formation by using a sodium acetate solution that mimics the crystallization of ice and releases heat upon formation. Children can pour the solution into molds to make ice crystal castles, polar bears, and seals. This is a great addition to your lesson plans and any other ice science experiments you have planned. Read “Exploring Weather During the Winter Months” for additional tips and winter-themed activity ideas that help children learn about winter weather.